Just went out and checked this- happy (and relieved) to report absolutely no sign of rust whatsoever on that rad support- in fact, it looks so good I wonder if it's already been replaced. however, the entire splash guard is missing, so there's that i suppose. Great news that you don't have rust on the lower rad support! Not sure what one can do to keep it that way. If your Maxima was a daily driver, just keep doing whatever they did with it or didn't do with it. For mine, it got this way after 15 yrs or so. So, I won't mind if it rusts in 15 yrs. It cost me $1,000 to repair the upper and lower frame, along with the hood lock bracket. Nissan only sells them as a whole frame now. The part from the shop was $550 plus his labor and taxes. The same part from eBay could have been had for $375. However, I didn't have time to wait, or I could have purchased it from eBay (OEM Nissan part) and given to shop to work on. A shop in Hempstead, NY called All Out Motorworks did the work. Took about 1.5 days from drop off to pick up. The shop is not real clean or modern, but he did the work and my car looks fine. I looked at three auto body shops in my area in Central NJ, and no one wanted to do it. They did give ballpark figure of $1,000, but didn't want to do it. Advice ranged from "drive it for a couple of years, and you'll have done well." to "that's not going to drop for another 5 yrs (I questioned this one)". Someone said "it's not structural" (then why is it welded???). Anyway, I found it odd people didn't want money to fix what I wanted fixed. The last guy dropped a hint, unintentionally, I think. He mentioned that once they start moving old parts around, and having to remove radiator and ac condenser, then o-rings need to be replaced, potentially rusted bolts may break and all other unpredictables. I think that's why they didn't want to deal with it. Anyway, my lower rad is fixed, and I'm happy. 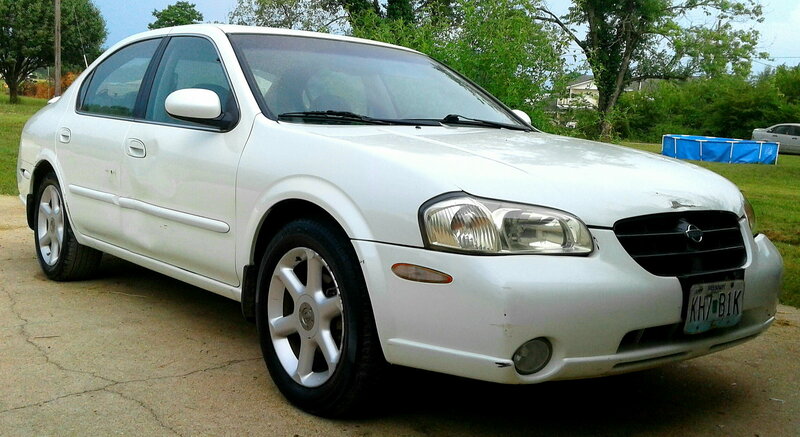 I bought car for $2,300, so with this $1,000, it's still a good buy, imo for $3,300. I'll wait till next summer to replace shocks and struts. Picked up a 2002 Maxima last year with 105,000 miles on it for cheap. It had a check engine light on, but was only showing up for the downstream O2 sensors. Drove it for a while and now I am ready to roll it into a ditch and set it on fire. Overall been a good commuter vehicle, which is what I was looking for, just wish it still was so I wouldn't have to be driving my GMC 2500 HD everywhere! Welcome. Not sure you'll find much help here but you can hope. New on here but ot to the import scene . Picked up an 01 se auto with 257k on it for $400 cause guy didnt want to wprk on changing alt (lazy i gues lol) , all leather but neglected some but no smoke or oil leaks , no rattles or knocks and has all timing set replaced and runs and drives great . Gonna stay n/a with it but go with a catback and cai and also have a set of 07q45 wheels to go on it . I have ran rotella 15w40 in all my race engines to my dailys with never a scatter or ill mannered happiing but this is my 1st vq30 ive had my hands on to play with and would like a lil input on viscosity on the oil and the tcs if there is a way to disable it as the dash switch does not work and finally the tach doesnt work so any help would be appreciated and im sorry if i am postig this in the wrong section , if i am lead me in the right area please .Im going to try and load a pic if my phone will allow , thanks in advance for any help and great to be a part of an overlooked community of cars ! Hello all, my name is Chop. I just landed a 2002 Maxima GLE a few months back, wanted to join the group on here and possibly get some useful info as I go through Maxima ownership. I have already done a few things- when I first bought it it drove OK but idled high and there was a code readout (can't remember.) Took it to AutoZone to get the code read and it was for camshaft on bank 1 being overtimed. I had no idea what that meant or how to fix it but luckily AutoZone had a printout that showed the most likely causes and solutions for the problem, two of the possible solutions was a) to remove and clean the camshaft solenoid for the faulty cam and b) get an oil change since apparently the oil lubes and helps operate the solenoid. So I did both and voila no more check engine light! BUT, it still idled high, so I figured OK the throttle positioner was affected by the previous problem, so I looked up some how to videos on youtube, and one I found discussed resetting the TPS on the car by turning the ignition key on and off several times while pressing the accelerator pedal all in a particular order (don't quite remember.) Anyway I tried that and sure enough it reset the idle speed to right where it's supposed to be. Hey guys, new member here. New to Maximas anyway, not so much nissans or VQ engines. I've had my 370Z for 3 years now, and had a 350Z for two years before that. So I'm picking up a 2001 5-speed with 207k miles for $250. At that price, I'm sure you can deduce that it's going to need some work. The CEL is on, the driver window isn't working (doesn't make any noise at all other than the actual switch moving), the AC fan isn't blowing, the struts/shocks are all pretty far gone, the rear tires are almost bald, and it's in desperate need of some detailing. That's all pretty simple stuff (except for possibly the AC issue which I'm clueless about) so I figure with a little bit of work and money, it could make a pretty decent daily driver. But on the bright side, once I put a new battery in it, the engine fired right up and ran smoothly after about a year of sitting. With that in mind, I don't have any grand plans about engine swaps or forced induction in mind for the Maxima. At least not yet, lol. After all the maintenance listed above, I do want to do a few small things to it. Life is too short to stay stock, after all. -Lower it. I don't want to go too low and worry about scraping, and I'd like to keep at least reasonably comfortable ride quality. Debating springs vs coilovers. -Exhaust. Don't want it too loud, don't want it too ricey, not really concerned with power gains. Just want to hear the exhaust a bit. -HID headlights and fog lights, because visibility. -Change the seats out. Either leather seats or some 350Z/370Z cloth seats (yes, I'm slightly obsessed with Z cars). -Maybe some other little accent pieces like a front lip or something. Basically, my 370Z is getting more and more track-oriented every time it goes up on a lift. So I want the Maxima to become the new daily driver that's quieter, cheaper and more comfortable to ride around in because I do a lot of driving. But yeah, that's about it. Looking forward to being a part of the Maxima community. My MAF Sensor keeps Frying?